Empathy IM setting 'Edit > Preferences > Automatically connect on startup' does not automatically connect empathy on ubuntu startup, instead it connect empathy to the internet when empathy is started. - Please note that the Gnome bug has gone a bit off track into a different issue. I hope that is sorted now. - With the new Unity interface this problem is even greater. Before that the easiest way to add an application to session startup was to drag-n-drop it from the menu into the Startup Application window. Now there is no menu by default. How do other applications deal with this? This setting means "go online when you start Empathy" not "start Empathy when I start my computer". Updating bug title to reflect this. Shouldn't the empathy package create an /etc/xdg/autostart/empathy.desktop file for empathy, with "X-GNOME-Autostart-enabled=false" set? 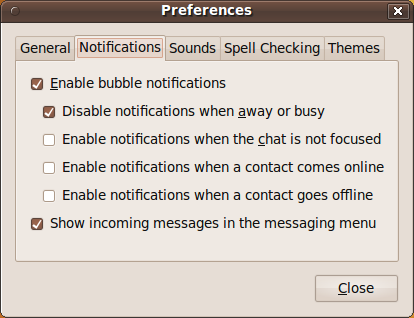 This way users wanting to auto-start Empathy can do so with a single click via gnome-session-properties and not need to create the entries by hand. I commented on the upstream about the proper way to solve this issue. "automatically connect when messenger started"
and If anybody think that its a bit long statement then attached image is an example for even long statements when it comes to ease of understand. Why would you not want to go online when starting Empathy? Pidgin handles this in a sane manner: Connections are either enabled or disabled. I agree with Alex French, i prefer to control in the account settings. That way i can choose which accounts to logon at startup. Sign me in when skype starts. Agree with comment above - I expected this to start Empathy or at least sign me in when I logged in. Either the option needs its wording changing (and perhaps another option added to make it actually start on login) or it made obvious how you can make Empathy start on login. Thanks Robomaster, that's basically what I thought 16 months ago when I first reported this bug. I agree with Liam: a .desktop file should be added to /etc/xdg/autostart with an AutostartCondition. However I am not sure whether reusing the same configuration key (/apps/empathy/autoconnect) would be acceptable. I submitted a patch to upstream to remove the startup option, as per comment 9 and 11.
should have an entry in the 'startup applications list'. I thought Emphaty doesn't start when "Automatically connect on startup" is checked because of bug, just as many others. I agree in full with cldx, Robomaster and alike comments considering pattern Emphaty should behave. It's the only way that makes sense. So is this bug about the preference or the non-working me menu at startup? After suffering for a while I added 'empathy -h' to my autostart and I think this is an obvious bug that should be fixed in Natty, it's not about cosmetics really, it means I'm not reachable by co-workers and friends when I think I am. Its been quite a while since suggests about the patch were made but it seems Amine have been away from Ubuntu scene for quite long so I am setting the status back to triaged. This reminds me of what it was like trying to get bugs fixed in Ubuntu pre-unity. The same here. 13.04, and no empathy autostart on logon, need to click empathy icon on tray menu. Will this ever be fixed?